How much fun would it be to have a pink feather tree for Christmas? Or a pink feather tree for all year round? Well, being a pink kind of girl I had to find out. 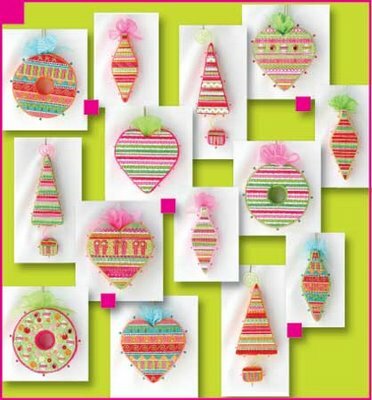 I have recently collaborated with fellow designer Ada Haydon of EyeCandy Needleart to design a series of oh so fun ornaments. Fourteen in all! Each ornament is more fun than the next. There are hearts, and trees and wreaths and vintage drops all in a retro glam meets Lily Pulitzer kind of style. You are going to love stitching these gems and who says they need to go back in the box after the holidays? Ada designed the canvases and I did the stitch guides. I started with a pile of threads in luscious shades of pink, lime, orange and red. The thread alone are yummy. Then I added a healthy dose of bling. Sequins and rhinestones. The finishing of course is the icing on the cake, or should I say feather tree. The finishing takes them to a new level. « Previous: Get Ready to Sign UP!! !